Today, I am having a special Once Upon a Time With… interview. That’s because not only am I getting the chance to interview one of my favorite new authors, A.F.E. 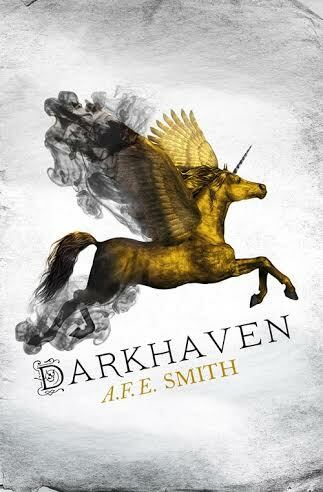 Smith, but it’s her RELEASE DAY for Darkhaven!!! 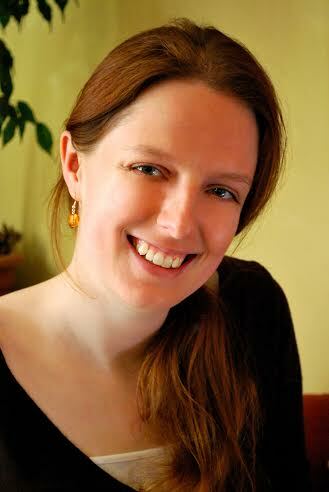 She gave us the amazing Barren Island Books interview, and it’s an honor to return the favor. Welcome, A.F.E. Smith! Like any good fairy tale, we’ll begin with Once Upon a Time. What’s your “Once Upon a Time”? Tell us about your beginning as an author. Where did you live and what sparked you to decide to write? I was born in London but I lived in the Cotswolds for most of my life. For those of you across the pond, the Cotswolds are what I imagine you imagine when you think of English countryside: rolling hills, little old villages, sheep. Very green. And I grew up reading all the time – pretty much literally; I started when I was two and I never stopped – so it just seemed the obvious thing was to move on to writing. I think a lot of readers become writers, one way or another. If you enjoy exercising your imagination in other people’s worlds, it’s natural to extend that into creating your own. The Cotswolds sound like an utterly brilliant place to write. I’ll have to visit if I can get across the Atlantic. So, in fairytales, a fairy godmother or perhaps a fae stranger appears to make dreams come true. In your case, the dream involves becoming a published author. How did your publication dream come true? As an aspiring author, I was terrible. I never went through any rigorous submissions process because I was afraid I’d fail and that would prove I was useless at writing. So I would enter a single contest, or submit to a single publisher’s open door period, then get rejected and spend the next six months rewriting again, before repeating the process. If I’d been in a fairytale back then, I never would have slain the dragon because I would have been too busy sharpening my sword (or pitchfork!) over and over again. Luckily for me, when the Harper Voyager open door came round, I was at the stage where I was ready for my biannual rejection. So I submitted my most polished manuscript, and the rest is history. As you may have gathered from my previous answer, I find it almost impossible to believe in myself and my abilities as an author. Positive feedback rolls right off me, while negative feedback hits home. Even now, as a published author … well, let’s just say that at the time of writing, I’ve had maybe 10–15 advance reviews of my book that are either good or excellent, and one single terrible one. You can guess which is the one that creeps into my mind at random moments and chews away at me. It’s a hard thing to battle, because I’m battling myself. No matter how often I remind myself of how far I’ve come, a part of me is always going to think I’m useless. So the way I intend to fight it is by looking it in the face and then carrying on regardless. Self-doubt is a rat, but it can be caged. I have this vision of you dueling a dark version of yourself and turning her into a caged rat. Okay, maybe I need to lose that vision. Onward! As we all know, the hero can’t ultimately triumph without enduring a few defeats. Can you share a defeat that you suffered in your writing career and what you learned from it? My first submission of Darkhaven was to another open door period held by a different publisher – Angry Robot, back in 2011. It wasn’t as polished, at the time, and it was rejected. Of course, it might have been rejected even if it had been polished. Because I think what a writer should learn from any rejection (though, of course, I find this very hard myself) is simply that the manuscript isn’t right for the person who rejected it. Not that it isn’t right, full stop. Okay. On the other hand, what do you see as your greatest victory as a writer? If you’ve read this far, I think you may agree that my greatest victory is the mighty feat of not allowing my intense self-doubt to crush me completely. But to be honest, writing anything is a victory. Finishing a book is definitely a victory. Hell, even being rejected is a victory. At least it means you’re trying. Where do you see yourself today? What’s happening in this chapter of your career? What are your current projects and what can we look forward to in the next year? In fairytale terms, I still see myself at the beginning of a long journey full of adventure. I’ve accepted the challenge and overcome my first obstacle, but there’s a lot more ahead of me than there is behind. This is the first chapter, but by no means the last. More practically speaking, in terms of current projects, my second book is with the publisher and the third is being written. Both are due out next year, so it’s going to be a busy one. Finally, every story should end with a Happily Ever After. If you could write your own “Happily Ever After”, what would it be? You know, I don’t really want a Happily Ever After. Not right now, anyway. Happily Ever After is what you get when the story is over, all the adventures are through and it’s time to close the book. Ask me again in fifty years’ time! So, for everyone out there wishing on a star hoping to be an author, what advice would you give them? Stop wishing and hoping. You have to make your own magic. Start writing, and don’t stop until you get what you want. Of course, by that time you’ll want something else, so you won’t be able to stop then, either – but that’s another story. If we’d like to learn more for the About the Author section of your story, what’s the best way for everyone to keep up with you? And is there any last message that you’d like to share? You can find me on my website (where you can sign up to my mailing list, if that’s your thing), on Facebook and on Twitter. As for a last message … I think in life, as in fairytales, achieving anything is a mixture of hard work, talent and luck. And you only control one of those things. So it’s important to remember that if you haven’t got where you want to go, it may not be because you’re not talented enough. It may simply be because you haven’t been lucky … yet. Thank you, A.F.E.! I highly recommend that everyone pick up a copy of her debut novel, Darkhaven. Let’s make sure her fairytale has a happy ending! This entry was posted in Once Upon a Time with... and tagged #BarrenIslandBooks, #HarperVoyager, A.F.E. Smith, Darkhaven, Debut Author, epic fantasy, Once Upon a Time With... by Harry Heckel. Bookmark the permalink.